Make an LED kite as part of the FLY! Kite Festival on Tuesday 11 September, 4:30 – 7:00pm at Mixenden Activity Centre. 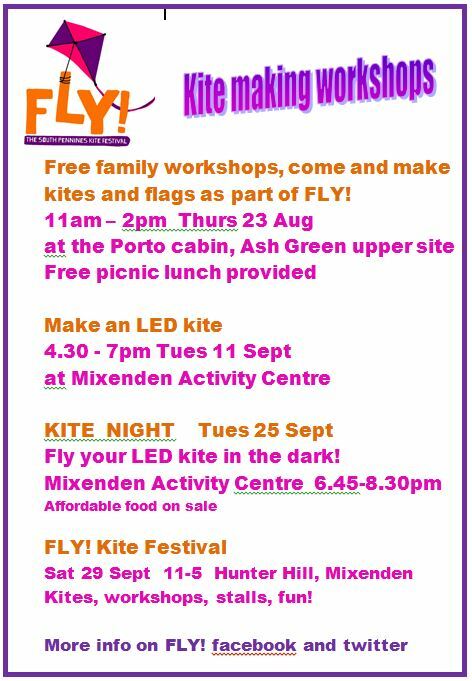 KITE NIGHT is Tuesday 25 September, 6:45-8:30pm at Mixenden Activity Centre. Fly your LED kite in the dark! Affordable food on sale. Then we come to, FLY! Kite Festival Saturday 29 September, 11:00am-5:00pm Hunter Hill, Mixenden. A series of free kite-making workshops have been organised in Calderdale, Bradford and Kirklees by FLY! The South Pennines’ International Kite Festival. The unique community project has been set up in partnership by Pennine Prospects, the Handmade Parade artists in Hebden Bridge and Yorkshire Water. They aim to use the arts and kite making to encourage more local people from all backgrounds to explore the stunning South Pennine landscape, its heritage and culture. 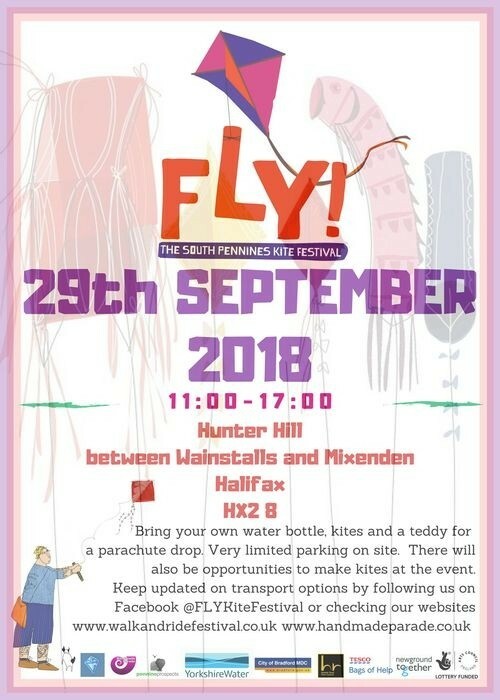 The workshop events will take place at local charities, community centres, schools and festivals throughout September culminating in a festival finale…a spectacle of kites and aerial artworks on September 29th 2018 at Hunter Hill, between Wainstalls and Mixenden, Halifax. Participants in the workshops will learn the art of kite-making from Handmade Parade artists, making quick and easy kites in the drop-in public workshops and more experimental, collaborative creations in the community workshops.